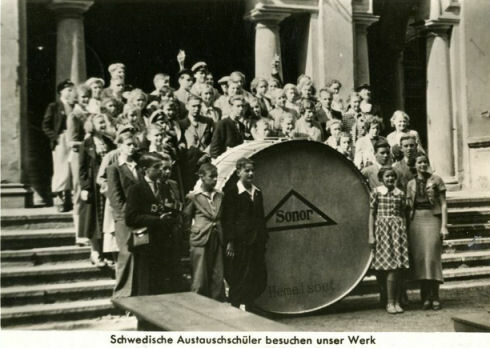 A lot of Sonor’s history has been written down by numerous people. A very interesting and extensive article can be found in the “Modern Drummer” magazine of August 1985. 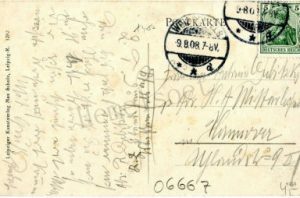 It gives a great insight into what Sonor has contributed to the drum scene from 1875 and on. Taking on an extremely simplistic view of the development of the percussion instruments that make up our modern drumset, we think in terms of the cymbals originating in Turkey or China, the tom-toms in Africa, and the bass and snare drums, as we know them today, developing in Europe. These were the instruments of military bands and symphonic orchestras, movements that were nowhere as present as in Germany. It was the German classical composers – writing for bigger and better percussion sections whose members, in turn, demanded bigger and better drums – who were largely responsible for the increased use of drums outside the military context. 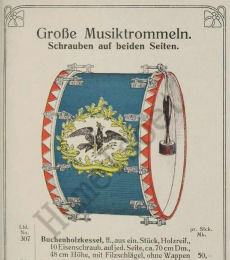 There is, therefore, a tradition of drummaking in Germany that goes back a very long way. The country’s leading drum manufacturer today is Sonor, a company that has been run by the same family for 110 years. 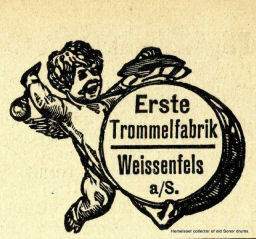 It was founded in 1875 by Johannes Link, who had previously been a wood turner and tanner. 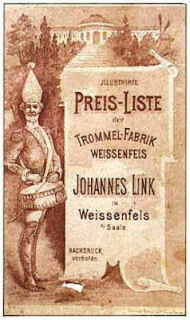 Johannes Link started by producing military drums and drumheads, but within the next 25 years, his factory at Weissenfels expanded in size and in the range of instruments that it produced, so that by 1900, the company was manufacturing a full range of top-quality percussion instruments. 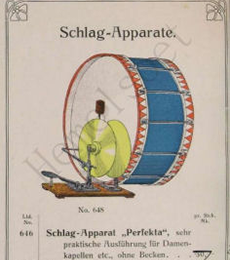 The 1899 catalog shows items like pedal timps, a snare drum with independent tuning for each head, and a snare drum stand-all of which we take for granted today, but which were up to the minute new ideas back then. 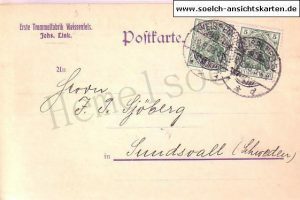 Johannes Link died in 1914 and was succeeded by his son Otto. 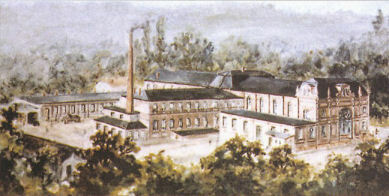 The company continued to prosper in Weissenfels, under Otto Link’s guidance, for the next 36 years. Strangely enough, however, it was another, quite separate, career he had that indirectly made the company’s present situation possible. 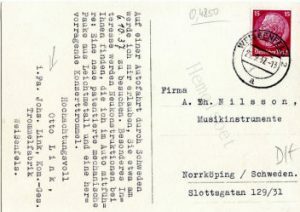 Otto Link, as well as being an industrialist, was Honorary Consul to Sweden. 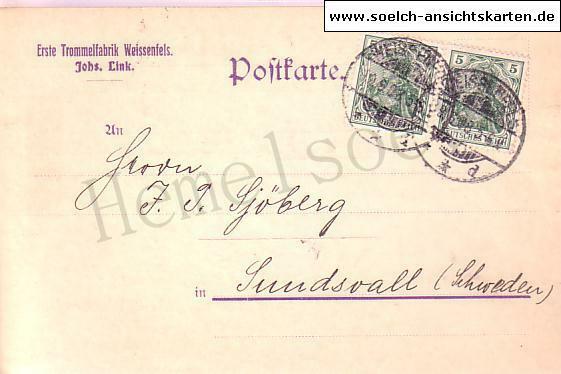 In 1946 Otto’s son, Horst, decided to move out of the Russian-controlled sector of Germany, because the Russians were arresting ex-officers and imprisoning them in Eastern Siberia, “which I didn’t like” he now adds dryly. He moved into the British sector, and rather than having anything to fear from the British Army, he was actually able to buy a disused barrack hut from them, which was to become the first Sonor factory in West Germany. 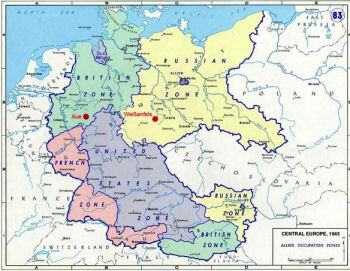 That is how Horst Link started doing business in the company’s present location of Aue in Westphalia. He started by only making drumheads. 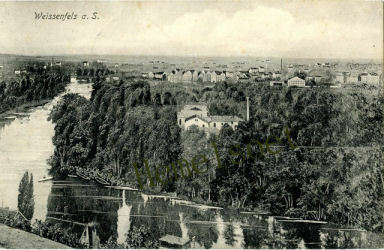 The Sonor factory at Weissenfels was now in East Germany, and so were Horst’s mother and father. When the border was closed in 1950, it was clearly only going to be a matter of time before the original Sonor factory would be expropriated and taken over by the State. 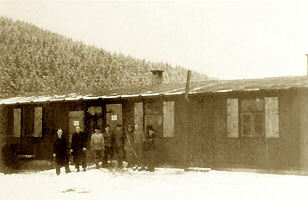 Preparations were made for Otto Link and his wife to escape to the West, but nothing was done until the police were sent to arrest Otto at his home. 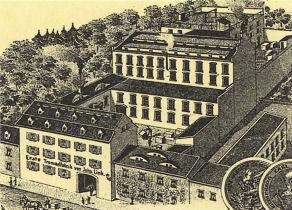 It was the family’s maid who saved Otto, by saying that he had already left for the factory. Otto, meanwhile, climbed through a window at the back of the house and made good his escape. Frau Link was able to follow her husband a few months later, but not without having some adventures of her own. She had to pretend to be visiting a cemetery near the border, where some friends were standing by with a fast car to whisk her away. So father and son were reunited in the West, but at this stage, they had nothing except Horst’s barrack-room drumskin plant. They needed land on which to build, skilled labor and capital. The local community in Aue welcomed them; the community was interested in the possibility of encouraging fresh industry in the area and it was relatively easy for the Links to obtain the land they needed. The capital was to come from an unexpected quarter. Even the experience that had been developed during this time was mostly lost. Two craftsmen from Weissenfels managed to escape to the West and join Sonor in Aue, but otherwise they had to start training new people in an area where, previously, there had not been any manufacturing industry, only agriculture. 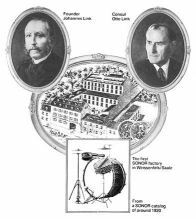 It was another ten years before they had sufficient skilled craftspeople to develop the company in the way they wanted, but sadly, halfway through this period, Otto Link died. Horst Link intimates that his father’s death came as a double blow to him, because when it occurred, he didn’t feel ready to take over the reins of the company, which was struggling to reestablish itself. But as so often happens in these situations, the son had no choice. Under his leadership, Sonor slowly and successfully grew until, in 1975 (100 years after his grandfather had founded the company), Horst Link had achieved what he had set out to do 20 years before. There is now a fourth generation involved in the family firm. Andreas Link is currently understudying his father and acting as his assistant. I suggested that this makes Andreas the Vice-President. This amused him, and he said that if Modern Drummer wanted to give him this title, he would accept it. The younger son, Oliver, is a keen drummer and artist; his talents are put to good use in his job as Advertising and Promotion Manager. At 25, Oliver is very aware of, and interested in, today’s music scene. The company’s image is in his capable hands; he has some first-class products to promote, but they have to be presented to the drumming community in the right way. 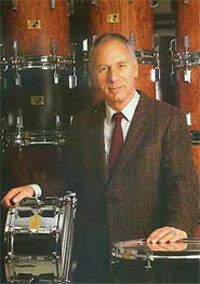 Oliver Link wrote and designed the recent Sonor catalog, The Drummer’s Drum. I think anybody who has seen it will agree that it is quite an achievement. Backside of this postcard dated Sept 25th 1937, in which he writes that he has some new light-weight timpanis and a very good new model “Konzerttrommel” that he likes to show.